Llamas are gregarious and highly social, living in groups of up to 20 individuals. Llama groups consist of about 6 breeding females and their offspring from the current year. This group is led by a male llama that aggressively defends his position by engaging in dominance fighting. This fighting consists of the male trying to wrestle the opponent to the ground by biting his limbs and wrapping his own long neck around his opponent’s. Dominance is achieved when the opponent has been pushed to the ground and has properly submitted to the victor. Llama submission stance is lying sideways on the ground with the neck lowered, and the tail raised. Like other camelids, llamas are very vocal, using a variety of low and whiny loud calls. Llamas make especially distinct vocalizations in the presence of predators such as canines to warn other group members of danger. Llamas are aggressive towards predators and have been reported charging, kicking, biting, and spitting. Llamas, like other camelids have long necks, limbs, rounded muzzles, protruding lower incisors, and a cleft upper lip. South American camelids, including llamas, alpacas, and guanacos do not have humps like the Old World camelids. Llamas are the largest member in this group. They have long shaggy hair which varies greatly in color. They can be many different shades of brown, black, peach, white, grey, roan, paints, spotted and many other patterns. There is less color variety in alpacas because they were bred to have a single uniform color to produce a consistent product and ease the harvesting of wool. Alpacas can be found in black, browns, grey, white or white along with another color. Llamas perform sexual reproduction known as "induced ovulation", which means that they mate first and the egg follows, not the other way around, as in dogs, cats, humans, cows, horses, etc. This means that you can plan when you want breedings to happen, rather than being tied to nature's schedule. Females are bred for the first time between 18 and 24 months of age. Males begin breeding between 24 and 36 months of age. They mate lying down, which is pretty unusual for a large animal. They mate for an extended period of time (20 - 45 minutes), also unusual in a large animal. Female llamas carry their baby for 330 - 368 days (about 11 - 11.5 months). Field breeding - A female is turned out into a field with a male llama and left there for some period of time. This is the easiest method in terms of labor, but the least useful in terms of prediction of a likely birth date. If your vet is good with ultrasound, you can combine this with the exposure dates to get a better idea when to expect the cria. "Hand" breeding - This is the most efficient method, but requires the most labor. Male and female llama are put into same pen, breeding is monitored. They are then separated and rebred every other day until one or the other refuses the breeding. Usually we can get in two breedings using this method, though we have had some studs that routinely refuse to breed a female more than once. The separation presumably helps to keep the sperm count high for each breeding and also helps to keep the condition of the female llama's reproductive tract more sound. If the breeding doesn't take (check at 2-3 weeks), the female is rebred once again. Llamas eat low shrubs, lichens, and mountain vegetation. Llamas make use of native shrubs and grasses including Parastrephia sp., Baccharis sp. (shrubs) as well as Munroa sp., Eragrostis sp., and Triseobromus sp. (grasses). Llamas tend to live in very dry climates and get most of the moisture from their food. Camelids consume about 2 to 3 gallons of water, and 1.8% of their body weight in dry food (grass, hay) per day. Llamas have three stomachs and are ruminants. When kept as domestic animals llamas adapt well to the same diet as sheep and goats. 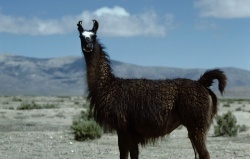 The Andean highlands, especially the Altiplano of southeast Peru and western Bolivia, is the natural habitat of L. glama. These plateaus are covered with low growth, including various shrubs stunted trees and grasses. In the Altiplano region, the northern reaches are reasonably temperate and mountainous, whereas the south is drier, desert-like and inhospitable. This page was last modified on 8 January 2016, at 16:25.